As baby boomers continue to age, the demand for universal design continues to grow each year. Universal design remodeling is the process of designing a living space without sacrificing visual appeal or style. As a result, we expect to see more open floor plans, roll-in showers, wider doorways, floating sinks and cabinets, and other wheelchair-accessible features in future renovation and design projects. Here are three rooms that can be remodeled into a more universally-functional space. 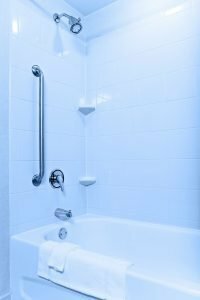 For those who are confined to a wheelchair, it can be difficult to maneuver around small, cramped bathrooms. Universal bathrooms will have plenty of floor space, and will be treated with a non-slip surface to minimize accidents. Lower seated toilets are recommended for those who have difficulty getting onto the toilet, along with the installation of grab bars or rails. When it comes to home remodeling, the kitchen is the second most popular project. In a recent survey, 69% of respondents said they remodeled their kitchens. In the last five years, nearly four in 10 home improvement dollars went into a home’s kitchen. To make your kitchen more universal, consider easily-accessible storage for your pots, pans, dishes, and food. Slightly taller cabinets can help for those who have issues bending over, while pull-out work surfaces can help those in a wheelchair. The bedroom is a very special room, and often the room that you spend the most amount of time in. Remodeling your bathroom to incorporate universal design can be easy, and incorporates unique and functional design elements. One of the biggest issues with a bedroom is space, so a universal bedroom should be wide and have plenty of floor space. Look for drawers and cabinets that are easy to open and close, and provide the right design to allow for the right grip.